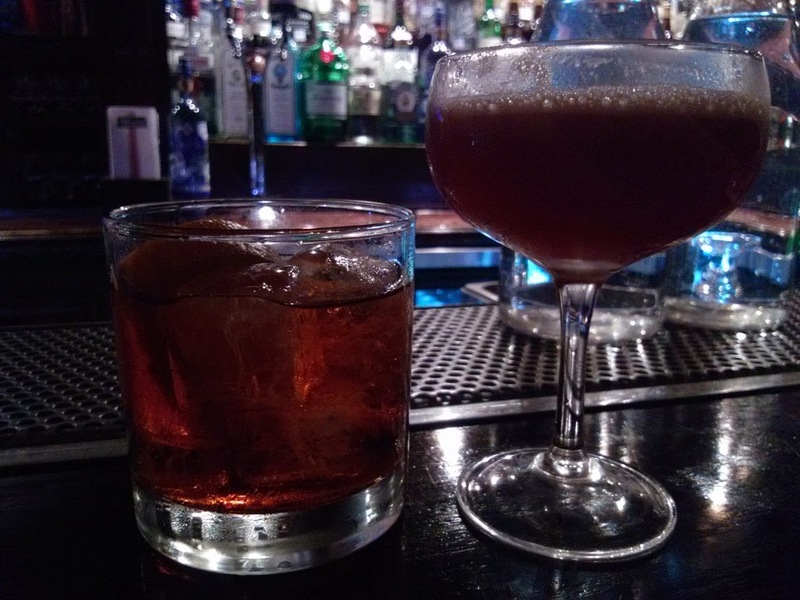 Houston’s new (less than a year, I believe) downtown bar Captain Foxheart’s Bad News Bar and Spirit Lodge is my kind of bar: spacious and dark with knowledgeable bartenders who make great drinks and aren’t pretentious about it. When I went to pick up my friend and told him we were going to go to a new bar downtown, we wondered whether they would let him in with his t-shirt, shorts, and flip-flops. No one said a thing. After we found the place, that is. First, I hate going downtown, which makes the resurgence in bars in downtown Houston all the more aggravating. But it’s a good thing for Houston, so I support it. It just takes me a year to visit the hot new bar, that’s all. Even after we found the address, we couldn’t find the place. There isn’t a sign. In fact, you have to go through the door to a law office, walk up stairs and enter an unmarked door. Now that I know it’s there, I like it. The bar is long, and it reminds me of a prohibition era bar, lots of wood and darkness. They did a nice job making it into a drinking establishment with a sense of easy-living foreboding. If that doesn’t make any sense, go there. You will see what I mean. The place makes you feel like you’re in some past era, and a tommy-gun fight could break out at any time. But you’re in the know. They’re not coming for you. You’re made. But enough about that. The bartender made me a Riverboat Bobsled, which she said was their most famous drink. I can see why. It’s a stiff drink made unique by the walnut liqueur. I couldn’t get over how the walnut flavor took over. The rest of the drink is not unusual, although the ingredients would be tasty by themselves: bourbon, Casoni (an amaro, sweet and bitter), orange bitters, and Angostura bitters. Those ingredients sound perfect together, but it’s the walnut that changes everything. It goes from being a modified Old Pal Cocktail to being something more. If I had to describe it, I wonder whether my grandma would ever make a pecan pie using cough syrup. Wait, that doesn’t sound good. But those are the flavors. There’s the medicinal citrus bitterness and the sweet nut flavor. And they work well together. This drink is good. Go have one. Now. Well, at least when they open at 5 PM. 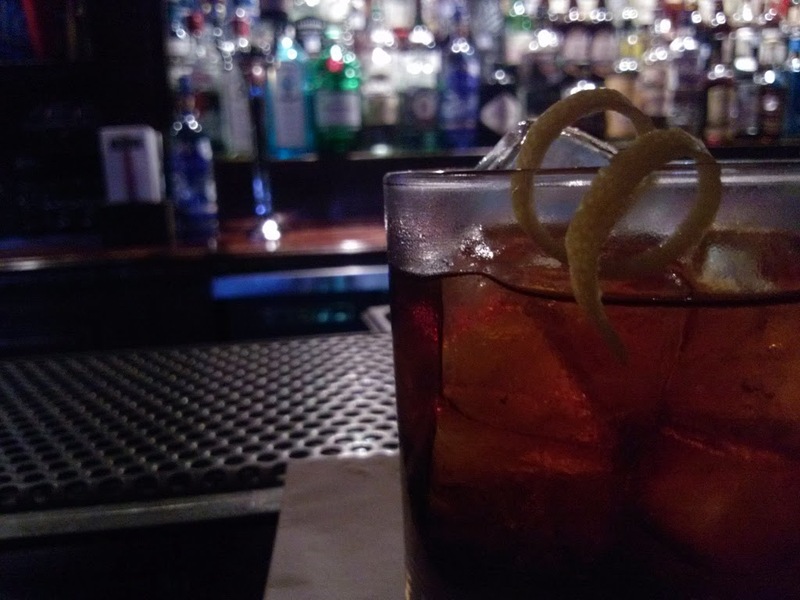 After that, I tried their Negroni, which they keep on tap. It was good, but I couldn’t tell a difference between their tapped version and a regular one. It’s simply a great drink, and they do it well. And then I tried the Barspoon Special No. 2, which was great. It’s a mixture of Mezcal, Punt e Mes, Becherovka, Campari, and Bianco Vermouth. I guess they just use a barspoon of them, but that’s a lot of ingredients. And they come together to make something bitter yet balanced. My kind of drink. In fact, I think it’s better than the Riverboat Bobsled, even thought that one gets all the press. My friend had three of the Bronx Cheer cocktails. It’s a fruity drink that’s sweet yet balanced. I would not have ordered three of them, for I like variety, but it was a damn fine drink. Next time, I will have to try their beer selection, which goes from craft to Texas cheap. But the cocktails themselves are worth a trip downtown. This place deserves to be called one of Houston’s best bars. Nice work, Captain Foxheart’s.